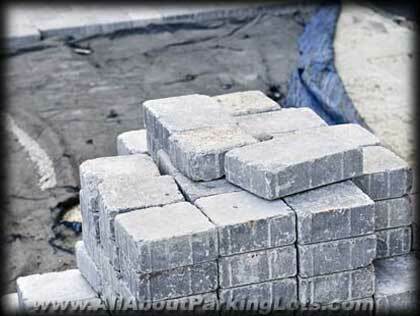 Is A Paver Parking Lot The Right Choice For Your Commercial Property? 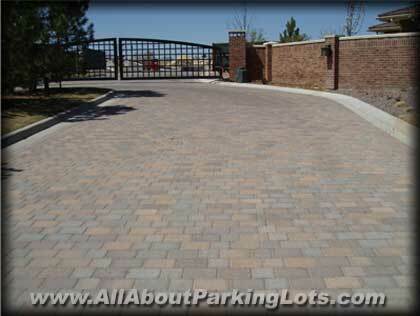 Looking for parking lot ideas or considering a new paver parking lot? 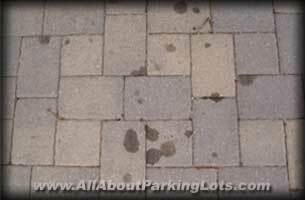 Which parking lot surface is best when choosing between paver, concrete or asphalt? 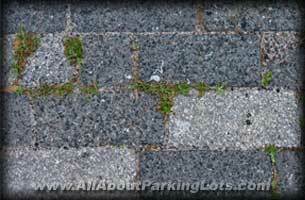 What are the benefits of a paver parking lot vs concrete, asphalt or even gravel? What type of ongoing maintenance does a paver parking lot require compared to the other types of parking lots? Whether you call them paver parking lots, concrete paver parking lots, brick paver parking lots, permeable paver parking lots or interlocking paver parking lots… they’re all basically the same when it comes to the the looks and installation process. But not all pavers are manufactured the same. Brick pavers are baked at extremely high temperatures and concrete pavers are formed and dried in a controlled climate settings. However, while brick pavers, interlocking pavers and concrete pavers provide a solid parking lot surface that mainly shed water off of the parking lot, permeable pavers allow water to penetrate into the soil or sub-grade beneath the pavers allowing much less water runoff. Permeable paver parking lots are much more environmentally friendly allowing less pollutants winding up into our rivers, creeks, streams and lakes. How common are paver parking lots? The further North we travel in the United States, the more likely we see asphalt parking lots. The further South we travel in the United States, the more likely we see concrete and paver parking lots. This is due to the amount of freeze and thaw cycles that occur in colder regions. Paver parking lots can be somewhat pliable since pavers are so small and there are spaces to allow for movement from freeze and thaw cycles, therefore cracking rarely happens. But minor heaving can become an issue since it’s much easier for water to reach the sub-grade and freeze and thaw. Keep in mind also, if you live in a snowy region, snow removal on a paver parking lot can be damaging to the pavers as there are many edges to catch a snow plow on. However, paver parking lots are extremely durable and can withstand de-icing products like salt, magnesium chloride and other de-icing chemicals. To install a new paver parking lot, in most cases, you’ll need blue print drawings which includes sub grade material and preparation specs, drainage specs, and striping and marking layout specs. In most cases, you’ll also need to include concrete curb and gutter, sidewalks and handicap ramp specs as well. In instances where your commercial property is not subject to city and county specifications, you can install a new paver parking lot without blue print drawings and engineering but you’ll still need a solid drainage plan. A parking lot can shed large amounts of water and that water must be managed and directed to areas where it will keep from flooding neighbors, streets and even buildings. In this case, hiring a reputable contractor is critical to avoid future problems. On the other hand, if you’re installing a permeable paver parking lot, drainage planning is still an important factor, but requires much different drainage planning and installation specifications. If you already have a paver parking lot and it’s beginning to show signs of aging and exceptional deterioration, or has a tremendous amount of patching and repairs and looks patchy, blotchy and uninviting, removing and replacing it is really the only option to making it beautiful again. In most cases, this can also be done without blue prints and specs, but absolutely should be performed by a reputable paver installation company that will do it right the first time. All parking lots age and deteriorate beyond repair at some point. The goal with any parking lot should be to maximize the life of expectancy as much as possible before having to completely remove and replace it. This requires a solid plan with frequent maintenance of every 2 to 3 years. Of the four types of parking lots, a paver parking lot is #1 when comparing cost and #3 when comparing ongoing maintenance. A paver parking lot can be the least expensive option when comparing to other hard surface parking lots. A paver parking lot requires the least amount of ongoing maintenance when comparing to to other hard surface parking lots. A properly installed paver parking lot with regularly scheduled maintenance can last up to 50 years. That variation in age can be determined by the stability of the sub-grade, the quality of the installation, the type and frequency of maintenance, the drainage plan and the climate of the region you’re located in. Types of ongoing maintenance you can expect to perform on a paver parking lot? Paver parking lots require such little ongoing maintenance, that when comparing the up front costs to an asphalt or concrete parking lot, which is less expensive, essentially what we’re doing is trading the long term ongoing maintenance costs over the lifetime of an asphalt or concrete parking lot for the up front cost of the installation of a paver parking lot. Some paver installation contractors even offer a lifetime warranty. But keep in mind a company’s warranty is only as good as the contractor that’s installing it. What good is a lifetime warranty if the contractor who installed it isn’t around to make good on it? If the short term, up front cost is a deciding factor, asphalt parking lots are an excellent, low cost option, depending on the size of your parking lot and the thickness requirements. 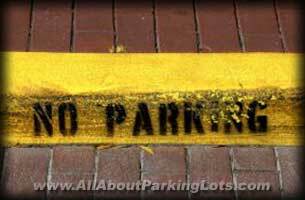 The long term trade off, however, is asphalt parking lots require more ongoing maintenance. If cost is not as important of a factor, and aesthetics are more important, then concrete parking lots or paver parking lots are the alternatives for a hard surface parking lot. While initially the up front costs are higher, long term they require less maintenance. Therefore, less maintenance costs. Also, take into consideration the effects of a paver parking lot if it’s not maintained properly or how it can look as it ages. 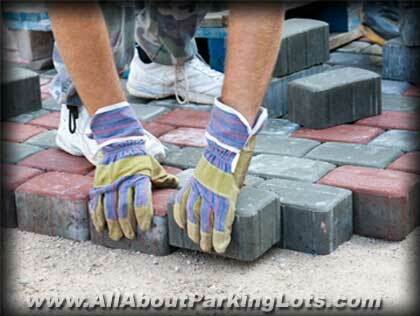 Paver parking lots can be a beautiful addition to commercial properties. 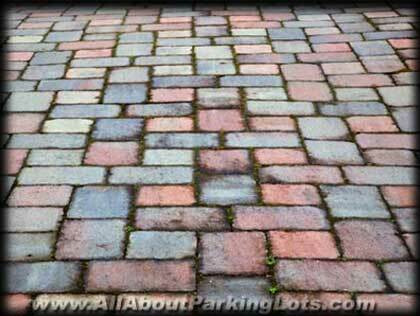 Paver parking lots come in a variety of colors to choose from. 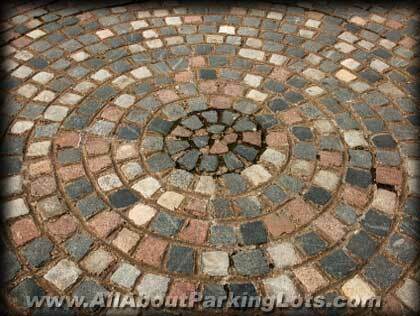 See some different Colorful Design Ideas For Paver Parking Lots. When it comes to durability, keep in mind, the amount of traffic and the type of traffic your parking lot will endure. Fire stations, car washes, or any other type of business that may have to endure exceptionally heavy vehicles, an above average amount of heavier vehicle traffic, or an above average amount of water runoff, a concrete parking lot may be a much better, longer term solution. Learn more about concrete parking lots here. If you’re considering having a new paver parking lot or permeable paver parking lot installed, an existing one completely removed and replaced, see our Paver Parking Lot Installation FAQ’s section for more information to ensure yourself a good, quality, and long lasting job. You can also learn more about the ongoing maintenance of a paver parking lot by visiting our Paver Parking Lot Maintenance FAQ’s section. Before you hire a contractor to install or perform maintenance on your paver parking lot, be sure and review our video and eBook series, "The Most Common Ways Paver Contractors Rip Us Off And How To Avoid Them" TM You’ll learn everything you need to know in order to hire a reputable contractor and get the job done right the first time! Or make it easy on yourself and save time, money and future headaches by hiring one of our pre-screened and background checked paver companies to install, remove and replace or perform maintenance services on your paver parking lot. Learn more or request an estimate from one of our Trusted Paver Installation or Paver Repair Contractors in your local area!